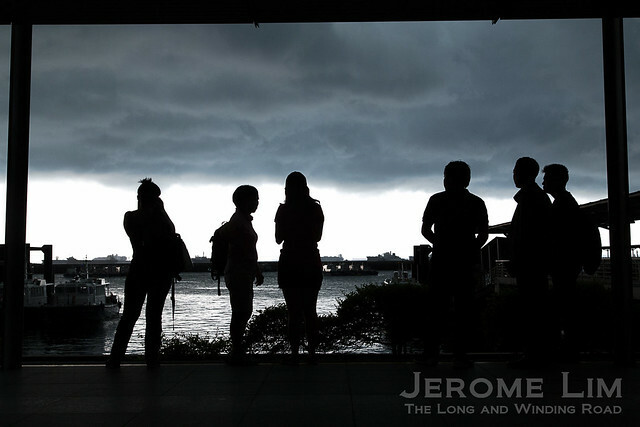 Rainstorms are very much a part of life in Singapore. They can be a nuisance, but are also welcomed for the cooler temperatures they bring. One storm system that is particularly dramatic, arrives with suddenness in the early mornings around dawn, bringing with it a fury of lightning, thunder and heavy rain. The squalls, which blow in from March to November, are known as the Sumatras – after the Indonesian landform they blow in from. 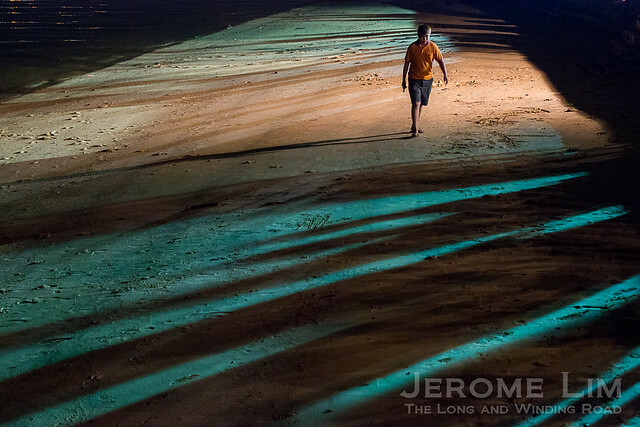 Sembawang Beach, one of the last natural beaches, illuminated by the lights of a celebration brought in by one of Singapore’s immigrant communities. The Malay Annals, the chronicles of the kings of old Singapura, makes one of the earliest recorded mention of Singapore’s shores. In one of it more well-known stories, a glance at the shimmering white sands of then Temasek was all it took to have Sri Tri Buana or Sang Nila Utama sail over from Batam. Confronted by the sight of a magnificent looking beast that the royal party believed to be a lion, Sri Tri Buana decided to remain on the island and establish a kingdom that he named Singapura after the beast. Except for a vicious attack of sawfish – told in another of the annals’ intriguing tales, the shores provided calm. The British East India Company would see great value in the shores some 6 centuries after Sang Nila Utama and came to lay what would be the foundations for modern Singapore. 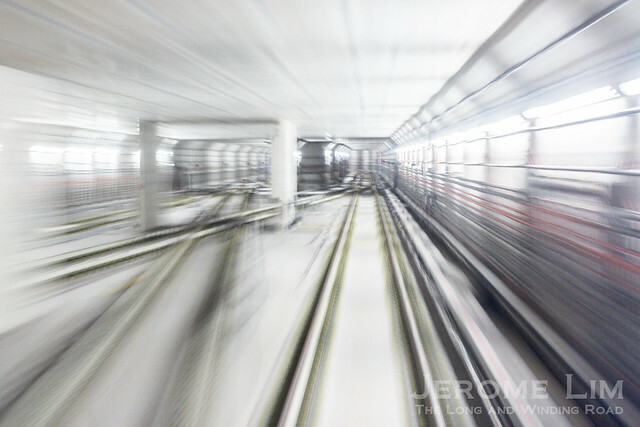 Crossing MRT lines, as seen from a moving train. Modern Singapore makes a huge investment in public transport infrastructure, a key component of which is the MRT. Construction of the first lines, which was initially resisted, began in the 1980s. Three decades on, Singapore is still in a frenzy of building a criss-cross of lines with a view to reduce the dependence on road transport in the longer term. In will also only be a matter of time before the MRT crossing into neighbouring Malaysia. Plans are in place to have the MRT run under the Tebrau Strait and into Johor Bahru. 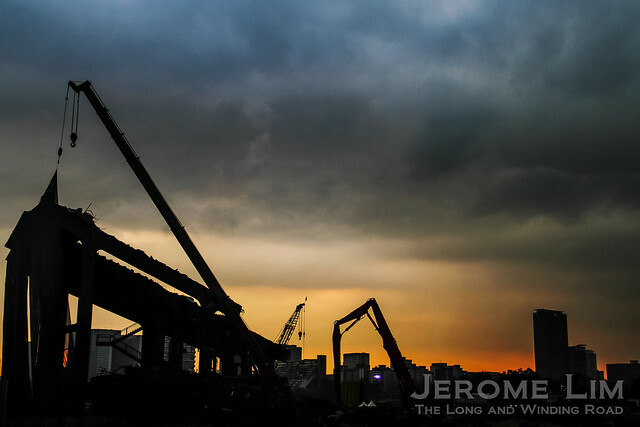 Working lights at Sembawang Shipyard at dawn. Once thought of as a sunset industry, the shipbuilding and repair business continues to serve Singapore well. With a long tradition in the industry, it would only be after independence that the business came to the fore. 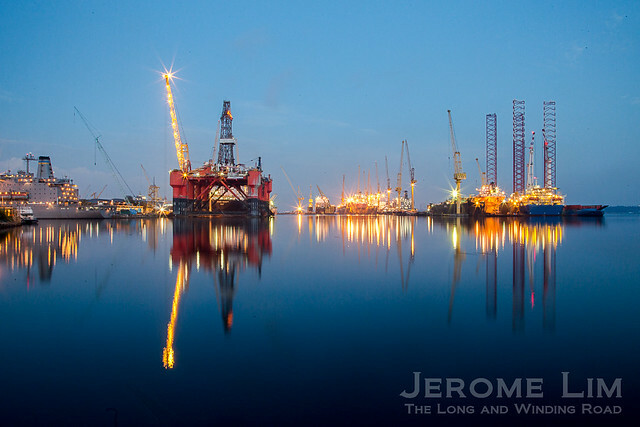 The two shipyard giants, Keppel and Sembawang, have their roots in the post-independence era, built on facilities inherited from civilian and military facilities established by the British. Both were an important source of jobs in early years and together with other shipyards, have established a reputation for efficient turnaround repair times. One contributing factor is the effort put in by some of the hardest workers across the industries that keep the shipyards running 24-7 whenever that is needed. 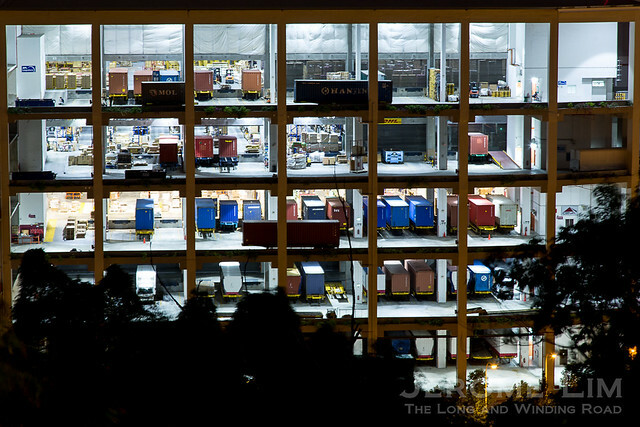 Inner workings of a multi-level ramp-up logistic centre revealed by its illuminations. The entrepôt trade, and what supports it, is one of the things Singapore has been built on. The arrival of the age of containerisation in the early 1970s, transformed the trade and also the ports and goods handling facilities. Like in public housing and in the light industrial landscape, goods handling has also now gone high-rise. Multi-level ramp-up logistics centres have become a feature of the industrial and suburban landscape over the last two decades with much more being built. The transport and storage trade, associated with these facilities, accounts for a significant 8% of the GDP. The petrochemical complex on Pulau Bukom and Pulau Ular / Pulau Bukom Kechil, seen from an offshore patch reef. 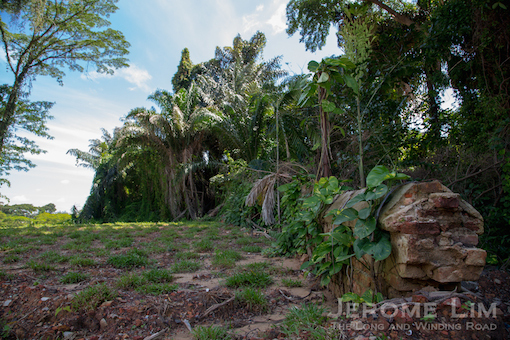 Pulau Bukom is the site of Singapore’s first oil refinery. For the oil industry in Singapore, going “offshore” takes on another meaning. Singapore’s beginnings as a main refining centre was in 1961 when Shell opened the first refinery offshore on the island of Pulau Bukom. Singapore has since also ventured into petrochemical processing. 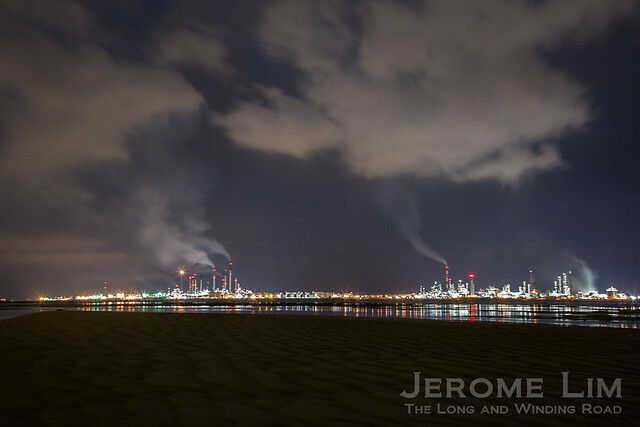 Although there are some onshore facilities still running, much goes on offshore with a man-made island made from a cluster of islands off Jurong, Jurong Island, being a main centre. Petrochemical processing facilities have also sprouted up on an expanded Pulau Bukom and on the neighbouring island of Pulau Bukom Kechil (which now has Pulau Ular and Pualu Busing appended to it). 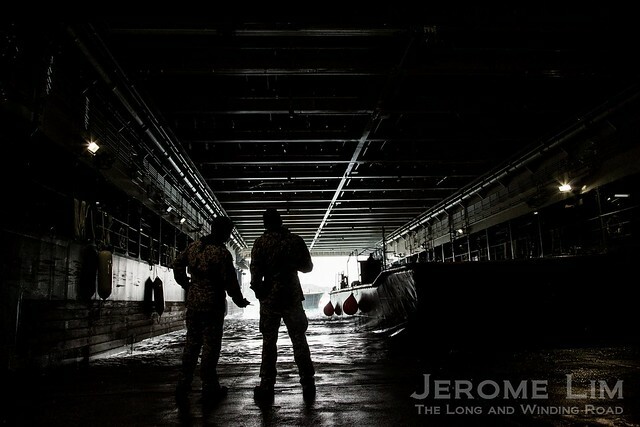 Inside the belly of a Landing Ship Tank. One way in which Singapore plays its part as a member of the international community is in providing humanitarian assistance in the event of crisis and disaster in the region. With 4 locally designed and built Landing Ship Tanks capable of moving men, machine and cargo over large distances, the Republic of Singapore Navy is well equipped to provide support for such a response when needed – as was seen in the aftermath of the 2004 Boxing Day earthquake and tsunami in Aceh. A corridors of sin and salvation. The lights are of a Buddhist Religious Centre. Geylang may be a neighbourhood that has built a reputation for its association with several of the 7 deadly sins, gluttony and lust included. What is perhaps surprising about the neighbourhood is that it is also where the largest concentration of religious institutions in Singapore can found (see also:Streets of Sin and Salvation). The deconstruction of the 1973 built National Stadium in 2010, where two perhaps three generations of Singaporeans connected to during the days of Singapore’s participation in the Malaysia Cup football competition. Regeneration of old places, neighbourhood and places Singaporean have grown to love, is very much a feature of life in Singapore. 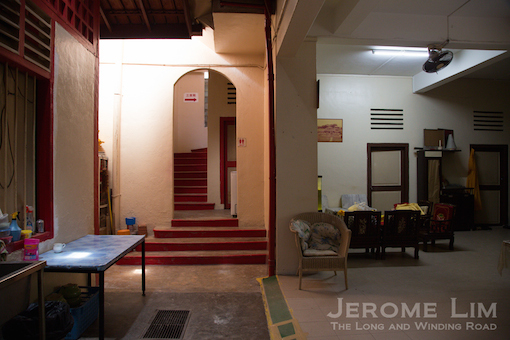 Many, especially from the older generations have had to cope with the loss of familiar places and the loss of that sense of home such places bring (see Parting Glances: Rochor Centre in its last days, Parting glances: Blocks 74 to 80 Commonwealth Drive and A world uncoloured). 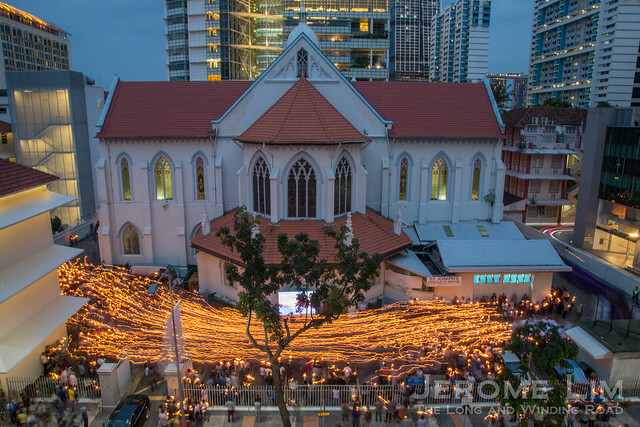 Good Friday at the Church of St. Joseph – where the religious traditions of Portugal are most visible in Singapore. With a large majority of the population made up of the descendants of the ethnic Chinese immigrants and also an influx of new immigrants from the mainland, and large minorities of Malays and those from the Sub-Continent, Singapore’s many smaller minorities tend to be overlooked. Over the years, Singapore has seen the likes of Armenians, Arabs, Jews, Japanese and as well as those from the extended Nusantara flavour the island. There is also a group that has in fact long had links with the area, the Portuguese or Portuguese Eurasians who feature quite prominently. Many have maintained the traditions of their forefathers and it is on Good Friday every year when some of this is seen in the Good Friday candlelight procession in the compound of the Portuguese Church. Where the light doesn’t shine. 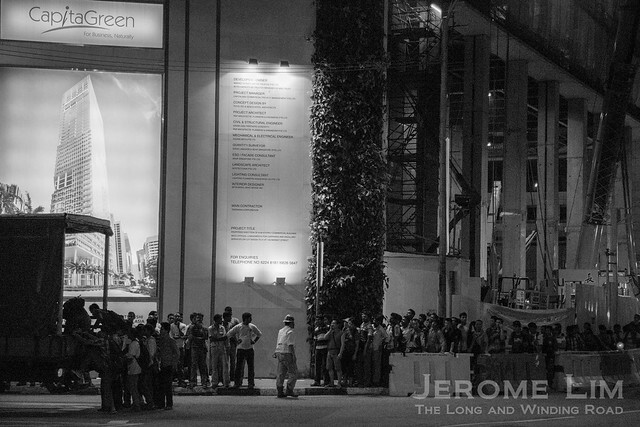 Workers on yet another skyscraper construction project waiting for transport to their dormitories, many of which are located in faraway and remote locations, late in the night. Work goes on on many construction sites, which employ labourers from various countries including China, India, Bangladesh and Myanmar, without whom the skyscrapers of modern Singapore would not have been built. These workers, not unlike the shipyard workers, work extremely long hours and are housed in dormitories located in some of the remotest of locations in Singapore. 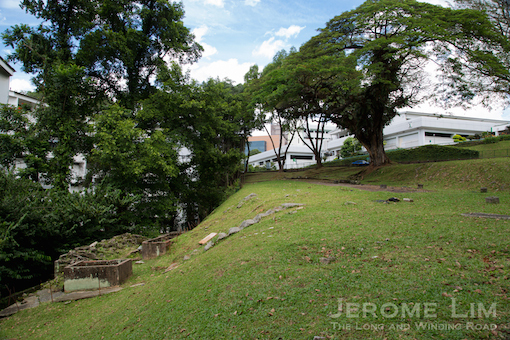 Fort Canning Hill, the scene of many a schoolboy adventure, is a place I constantly find myself drawn to. 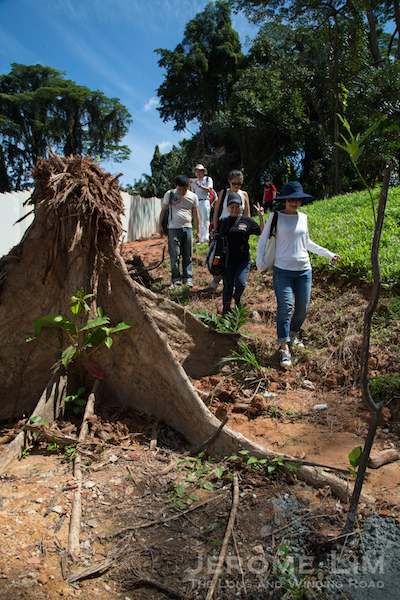 The attraction of the hill, where mortals once feared to tread in its days as Bukit Larangan – the Forbidden Hill, is perhaps the air of mystery that surrounds it. 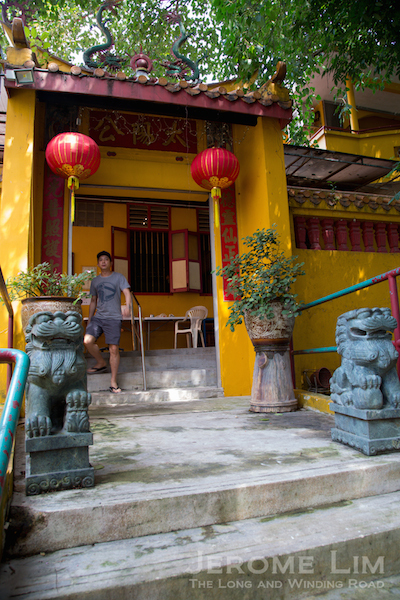 Its slopes were believed to be the abode of the kings of ancient Singapura, in life and in death. Even with the interventions of the ever changing world, it still is where the ghosts of a Singapore well forgotten, are ever present. Not a typical ghost seen at Fort Canning Green. The area of the forbidden hill (what Bukit Larangan, its name in Malay, translates into) that I find the greatest fascination for is its north-eastern slope. Here, the opportunities for an encounter with a ghost of the past, are plenty. The slope is where a mysterious a tomb is found, purportedly that of the last of the kings of old Singapura, Iskandar Shah. The Keramat, which some believe to be the tomb of the last king of Singapura, Iskandar Shah. This tomb, venerated as a keramat, gained the attention of John Crawfurd on his first visit to the hill, just three years after the East India Company’s settlement was established. Crawfurd, who was later to be appointed Singapore’s second Resident, made a note of his walk around the hill in his diary. 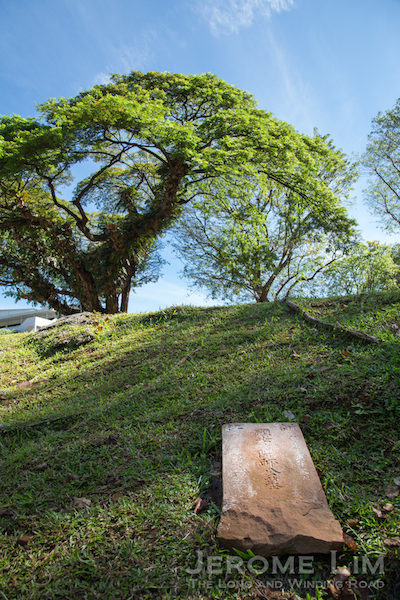 The interest he had on the hill was motivated perhaps by the observation that the “only remains of antiquity at Singapore, besides the (Singapore) stone, are contained on the hill”. On the eastern slopes of Fort Canning Hill. Crawfurd describes the ruins that were observed on “a greater part of the west and northern side of the hill”. Going further , he takes note of “another terrace, on the north declivity of the hill … said to have been the burying place of of Iskandar Shah“, a claim he suggested was apocryphal for good reason. It should be noted that Crawfurd was mistaken in his assumption that the long axis of the hill ran east-west instead of north-northwest to south-southeast and he would have been referring to the eastern slope of the hill in relation to the location of the tomb. 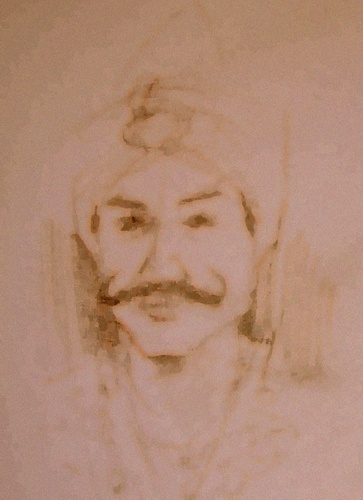 An artist’s impression of Parameswara, thought to also be Iskandar Shah (source: Wikipedia). The tomb seemed already a place of veneration even then. Crawfurd also takes note of the “rude structure” raised over the tomb, to which “since the formation of the new Settlement … Mohammedans, Hindoos, and Chinese equally resort to do homage”. The tomb has certainly added much to the mystery and superstition that has surrounded the hill over the intervening years. One rumour has it that unexplained events that led to occupying Japanese troops abandoning the British Military built barrack blocks on the hill during the war, had be due to the intervention of the tomb’s occupant. The barrack block at Cox Terrace with the old Christian cemetery in the foreground (photo online at http://www.nas.gov.sg/archivesonline/). One of these barrack blocks, lies just northwest of the tomb at Cox Terrace. A squash centre in my schooldays and and arts centre after, it now masquerades as the fancy sounding Singapore Pinacothèque de Paris, a private art museum. 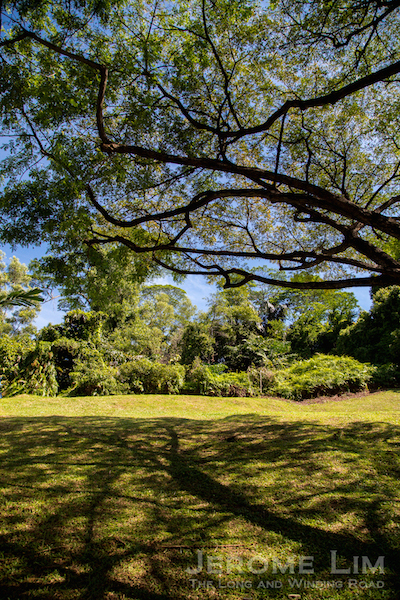 The museum overlooks what is today a most wonderful of space we know as Fort Canning Green. It comes to life occasionally when events such as theatre and musical performances under the stars, are held on it. And when it is kept clear, it is a place, as it was in the days of my youth, where an escape could be found in. Fort Canning Green today, well manicured, but still where many ghosts of the past are to be found. A stage set for the spirits of a Shakespearean play, The Tempest, at Fort Canning Green. There is much on and surrounding the green that will remind us of its previous use. A brick wall that encompasses most of the grounds around much of its perimeter give very clear hints of its days as an old Christian cemetery, as do the two cross adorned Gothic style gates intended as entry points. Information on the cemetery, the second Christian cemetery to be used in Singapore, is mostly contained in a 1912 register compiled by H. A. Stallwood. The register was published in the Journal of the Straits Branch of the Royal Asiatic Society (JSBRAS) and was an attempt to create on as no register of burials for the cemetery could then be found. A general view of the cemetery in the included with the 1912 register. The south east corner of the cemetery in 1921 (The cemetery seen in 1912 (photo online at http://www.nas.gov.sg/archivesonline/). The Cemetery stands on the slope of Fort Canning Hill, and is approached from the South by Fort Canning Road, through a gateway designed partly in the Gothic style of Architecture. It was opened in 1822 to take the place of the first Christian Cemetery which was situated close to where the flag-staff at Fort Canning now stands. 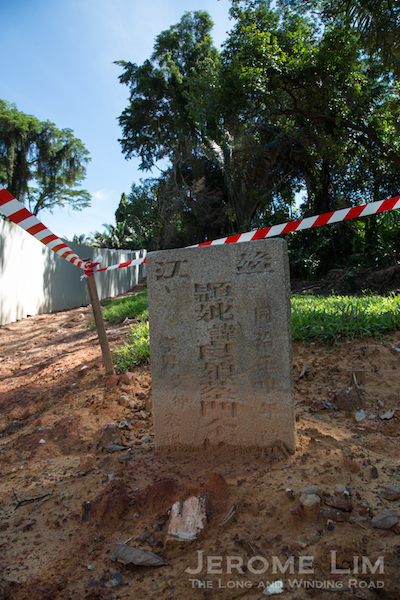 It was closed when the Cemetery in Bukit Timah Road was opened in 1865. One of the two gothic gates that serve as the entrances to the old Christian cemetery at Fort Canning – also from the 1912 register. The gates are still standing. Possibly one of the last burials to have taken place, that of young Ada Sutcliffe (year of death incorrectly recorded in the 1912 Regsiter as 1865). Close-up of a tomb, possibly taken in the late 1940s by Richard Stone (online: http://www.stone-family.info/stone-richard-photos.html). To those who feel an interest in Singapore and its history, few places in the Settlement offer so much of interest. Many old residents lie buried here, and many tombstones testify to the number of lives sacrificed by members of the Civil Service, who were called to rest at a very early age, whilst taking their share in the administration of this Settlement, of which we are all so proud. The United Services also yield their quota of names, unfortunately, some well-known, if not illustrious, in the annals of their country. Fort Canning Green is still an attraction for those who appreciate quiet, contemplative surroundings. 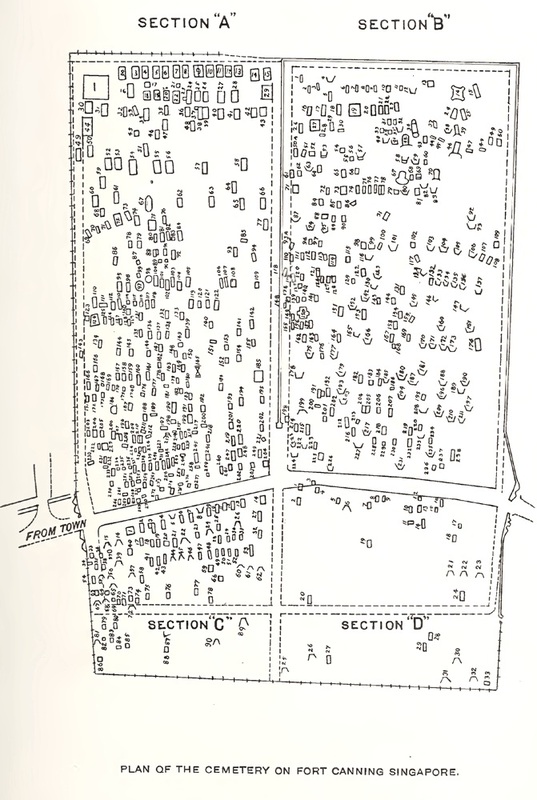 The layout of the cemetery from the 1912 Register. The oldest tomb identified by Stallwood, one from 1821, belongs to a John C. Collingwood of the ship “Susan”. Its presence in the cemetery, which was only opened in 1822, was attributed to it having been relocated from the original cemetery. The last burial was however incorrectly identified as being that of two year old Marie Dominica Scott in 1868. A check against the register’s listing of graves has the child’s death occurring instead in 1858. The 1858 death was also confirmed by the brother of the deceased in a letter published in the Straits Times on 17 July 1912, written to point the error out. A photograph from the 1912 Register. A memorial to the men of HMS Niger that is also mentioned in the paper, is in the centre of the picture. The cemetery seen in 1912 (photo online at http://www.nas.gov.sg/archivesonline/). Within the walls, two noticeable structures that belonged to the cemetery remain. Both are in the southwest corner. The larger of the two, said to have been the largest in the former cemetery, is dedicated to the memory of James Brooke Napier, the infant son of William Napier. It was after William, a lawyer and the founder of the Singapore Free Press, that Napier Road was named. A photograph of the memorial to James Brooke Napier from the 1912 Register. The Napier Memorial and a former barrack block turned art museum at the top of Fort Canning Green. William Napier was for a short while the Lieutenant-Governor of Labuan. He serve under Governor James Brooke, who is better known to us as the first of the white Rajahs of Sarawak. It was after Brooke that the infant was named. James Brooke Napier died at sea on 17 February 1848 at the age of 5 months and 24 days. His mother was Maria Frances Napier was the widow of the illustrious George D. Coleman, who Napier married not long after Coleman’s death in October 1844. George Coleman, Singapore’s first public works architect, is best known to us as the man behind the beautiful Armenian Church and for lending his name to the street on which he had his house and to a bridge over the Singapore river. The cemetery is also one connected with Coleman in more than one way with the second set of the large structures mentioned, the two cupolas were thought to have been designed by him. Located just down the slope from the Napier memorial, the cupolas seem to have been of ornamental value and intended – it is suggested – to provide shelter for rest and for contemplation. The southwest area of the cemetery with the cupolas and the memorial to James Brooke Napier visible. Possibly taken in the late 1940s, it is from a wonderful online collection of photographs taken in Singapore from 1948 to the mid-1950s by Richard Stone (online: http://www.stone-family.info/stone-richard-photos.html). Coleman was also laid to rest in the cemetery. An Irishman, he was believed to have been a member of the Church of Ireland. A mausoleum to Coleman, who died in 1844, was located at the non-Anglican section, in the cemetery’s northwest corner. 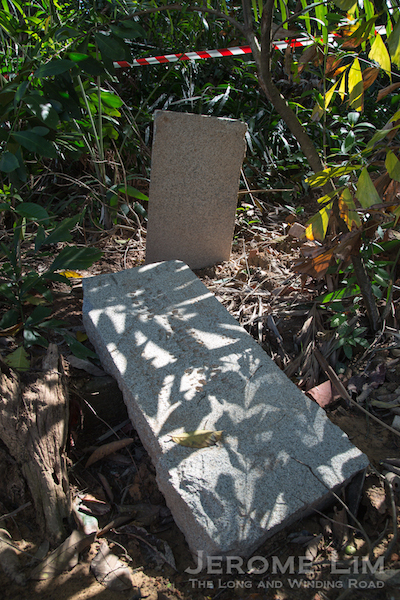 All that remains of that is its memorial tablet, which can be found embedded in the western wall of Fort Canning Green, not far from where his mausoleum was located. Coleman’s cupolas with a view towards the northern Gothic gate. The tablet belonging to the tomb of George D. Coleman on the western wall – just below Fort Canning Centre. George D. Coleman’s tomb in the northwest corner seen in 1956. The tomb was one of about 120 graves retained when the cemetery was converted into a ‘Garden of Memory’ in 1954 (photo online at http://www.nas.gov.sg/archivesonline/). Coleman’s tomb was one of those that stood until the early 1970s. It was one of some 120 tombs identified for preservation by the Committee for the Preservation of Historic Sites when a decision was taken in the 1950s to turn the cemetery into a “garden of memory” in the early 1950s. The decision, prompted by the state of neglect and ruin the historic site was in, resulted in the exhumation of more than four hundred graves. An effort was also made to preserve the memory of those buried in the exhumed graves by embedding the headstones and memorial tablets of the removed graves into the walls of the cemetery. An extension to the existing wall had also to be constructed at then open eastern perimeter to permit this and the work was completed in 1954. 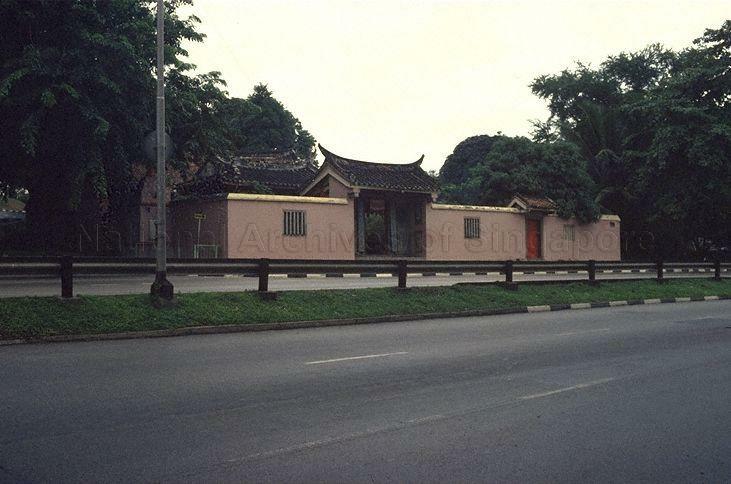 The garden, still with a scattering of graves, in 1974 (photo online at http://www.nas.gov.sg/archivesonline/). Another view of the former cemetery in 1974 (photo online at http://www.nas.gov.sg/archivesonline/). Gravestones embedded into the walls. The writing on the walls now include grave stones from a mid-1970s exercise that saw all remaining graves exhumed and yields a rather interesting mix of stories from the former graves. In it we see many who came from far and wide bringing a diversity to the new settlement. We also see many names of notable personalities from the settlement’s earliest days. Examples of both include names such as Aristake Sarkies, who was Singapore’s first Armenian merchant, and also Jose D’Almeida, who was to be knighted by the Queen of Portugal and who was to become the first Portuguese Consul General to the Straits Settlements. D’Almeida Street is named after him. The memorial tablets embedded in the walls tell us of many who came from far and wide in the early decades of British Singapore. A tablet belonging to the grave of Aristake Sarkies. From the grave of Charles Spottiswoode, a merchant after whom Spottiswoode Park is named. There are also the stories of those who are less recognisable. One name that I could not help but notice on the walls is that of Emily Louisa Ottoson. Ottoson is a name that I am familiar with as that of Singapore’s first Japanese resident, John Matthew, also known as Otokichi Yamamoto. Behind the name is a fascinating tale that begins with Otokichi’s unitended departure from the country of his birth (a previous post on the Japanese Cemetery touches on the story). Emily Louisa it turns out, was John Matthew’s young daughter. She died in November 1852, a few months short of her fifth birthday. The memorial tablet for Emily Louisa Ottoson, the four year old daughter of John Matthew Ottoson a.k.a. Otokichi. A resident of Japanese origin, Otokichi had a very eventful life out of Japan that started with him being lost at sea for 14 months (see: Voices from a Forgotten Past). The young ages of many who were interred in the cemetery is also hard not to notice. Many names in the walls are those of children and infants. There are also many who passed on in their prime, which the 1912 register touches on, saying: “many tombstones testify to the number of lives sacrificed by members of the Civil Service, who were called to rest at a very early age, whilst taking their share in the administration of this Settlement, of which we are all so proud“. A tablet from the grave of Edward Presgrave, a civil servant who passed away at the age of 35. One in this category was an Edward Presgrave. A contemporary of John Crawfurd, Presgrave served as the Registrar of Imports and Exports and concurrently as the Deputy Resident of Singapore. He reportedly died from a sudden attack of paralysis in 1830. On the basis of the register, he shared a vault with the Rev. Robert Burn. The Reverend, who died in 1833, was the first Anglican Resident Chaplain in Singapore and his appointment in 1826 is significant from the perspective that it marks the founding of the Anglican Church in Singapore. A tablet belonging to Rev. Robert Burn, Chaplain of the Settlement, who apparently shared the same vault as Edward Presgrave in the Anglican section at the top of the slope. There are many more stories that are to be found in the walls. Estimates of the number buried in the cemetery vary greatly. The 1912 register has list of over 550 names, while a Straits Times report in September 1952 has it as more than 700. The vast majority of those buried would have been of those of European descent. There are however a substantial number of Chinese, early converts to Christianity, who were also buried there, evident from the embedded grave stones with Chinese inscriptions. From these we can also see that the tradition was maintained in the manner the graves were inscribed, even with the embrace of a non-traditional faith. 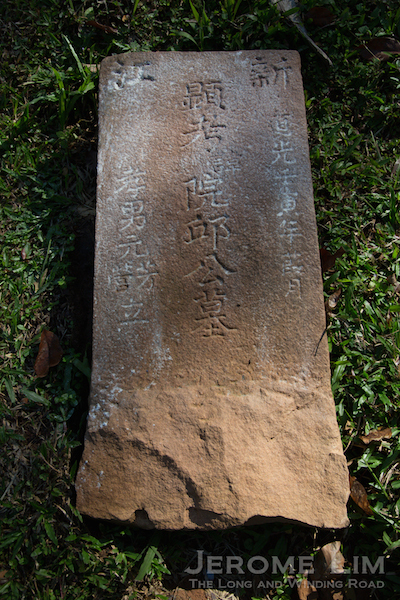 An example of an early Chinese Christian grave in which the Chinese tradition is maintained found another old cemetery in Singapore. Mixed into the reminders of the old (Christian Cemetery), there are also the reminders of the new (Christian Cemetery). The “New Cemetery” or the Bukit Timah Christian Cemetery, replaced the Fort Canning cemetery as a Christian burial site and it was from the new cemetery that the cluster of gravestones seen in the northeast corner of the grounds had been moved from. The move was made when the graves in the new cemetery, located at what is today Kampong Java Park, were exhumed in 1970. 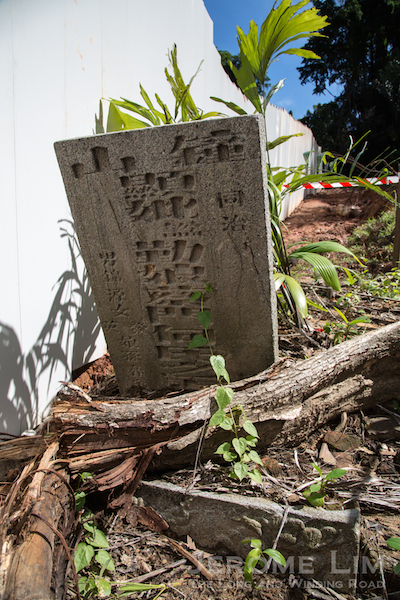 The twelve graves stones that were moved were ones deemed to be of historical value by the then sub-committee on the Preservation of Buildings and Sites of Architectural and Historical Interest. Gravestones moved from the ‘New Cemetery’ at the northeastern corner of Fort Canning Green. The exhumation of the remaining graves, undertaken in the mid 1970s, was part of an exercise to turn turn the hill into a huge park and green lung in the city. Named Central Park, it extended the reach of a previous public park, King George V Park on the west side of the hill, across to the east of the hill and incorporated parts of which had previously been used by the military, as well as the former cemetery site. Plans then included a roller skating rink, which was built, and also a cascading founding. The latter would have occupied the grounds of the cemetery and was fortunately not built, leaving us with a space in which the ghosts of the past are not forgotten. A southward view through the James Brooke Napier memorial. The quiet green surroundings of Fort Canning Hill provides the setting for the Pinacothèque de Paris’ home away from home, in a building whose best features the museum seems to have brought out, especially with its nighttime illuminations. 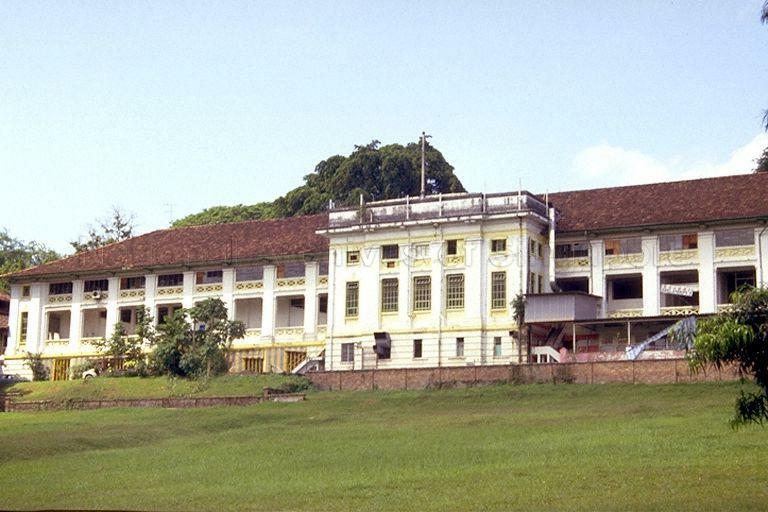 The rather majestic looking building, looking resplendent after a huge makeover, dates back to 1926, beginning its life as a barracks block of the Malaya Command Headquarters. The Malaya Command HQ occupied a large part of the grounds of a mid-18oos British fortification, of which part of the wall and a gate, the Fort Gate, remains. Named after Lord Canning, the Governor-General and Viceroy of British India at that time, the fort was also what gave the hill its modern name. The new glow at the formerly very dark cemetery at Fort Canning. I first got to know the three storey building that is now the Pinacothèque in my days of youthful adventure when the hill was a draw for as much for its seclusion of the hill, as it was for its mystery. Known also as Bukit Larangan, the Forbidden Hill, it was so named as it was the abode of the ancient kings both in life and in the afterlife. The dark and uncertain slopes, desecrated by the ornaments of the new order the most noticeable of which were the reminders of Singapore’s first Christian burial ground, seemed more forbidding then than forbidden. Fort Canning Centre at the start of its transformation into the Pinacotheque de Paris. The monuments on the hill to the garrison no one imagined could be defeated, were less forbidding. In former barracks block, then converted into the “world’s largest squash centre”, Singapore Squash Centre, one was never without company. Established in 1977 when the game of squash rackets was at the peak of its popularity in Singapore, the centre boasted of 25 courts and as a facility for the game, was well used up until the 1980s. Unfortunately, the good times were to be brought to an end at the end of the 1980s. Plans were announced in 1985 to revamp Fort Canning Hill into a focal point for cultural and recreational activities in the city, with the barracks block serving as its hub. Following the expiration of the centre’s lease for the building in 1987, the building was renovated and unveiled as the Fort Canning Centre in 1991 into which arts related tenants such dance studios and theatre groups moved. The building in the 1980s (National Archives of Singapore). Overlooking Fort Canning Green, the site of the former Christian cemetery, the Pinacothèque de Paris, which opens its doors on 30 May 2015, adds not just a stunning backdrop to the now open-air concert venue, but also provides a good reason to head up a hill on whose slopes much of our early history was written. In a Singapore where we seem to be fond of displacing both the living and the dead, it always is a nice surprise when bits and pieces of the displace turn up in a space whose use has evolved. A recent set of such discoveries on the grounds of the Singapore General Hospital (SGH) was made by Singapore’s foremost tomb hunters, Raymond and Charles Goh; discoveries that connect the land on which much is now done to aid the preservation of life, with a time when it served as a place where those whose life had passed were put to rest. A recent discovery on the grounds of SGH. 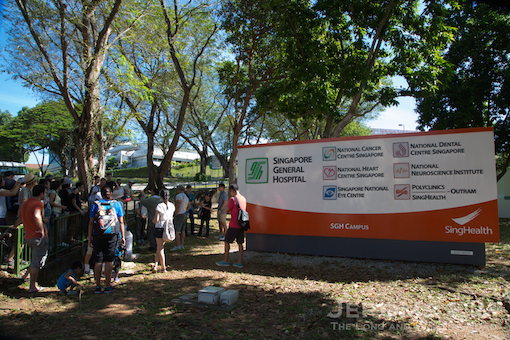 The elevated grounds of SGH, made it an obvious choice for a institution for treatment and convalescence; having been identified as “high and dry”, “admitting of easy drainage” and “open to all prevailing breezes”. And, it was where the General Hospital and also a Lunatic Asylum was moved to in the 1880s. Participants on the trail negotiating the slopes of Tiong Lama. The terrain around the site, described by a 1875 Municipal Engineer’s Office report as one of undulating hills of clay and laterite, also made it a choice location as a Chinese burial site, 29 acres (about 12 ha.) 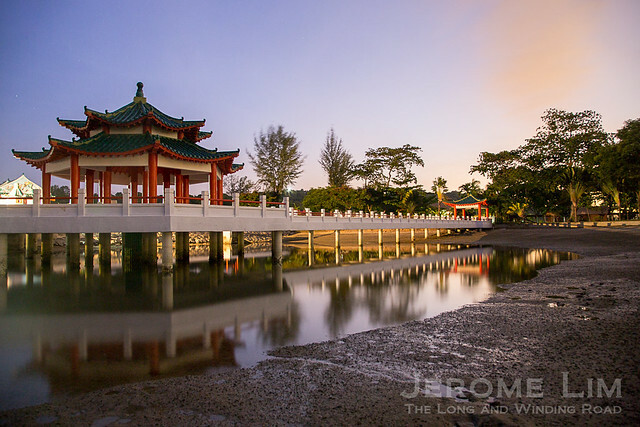 of which had initially played host to a Hokkien cemetery, one of the first Chinese graveyards in Singapore, that came to be known as Tiong (or Teong) Lama. The report also stated that what it described as a well kept site, had been closed for 16 years and had “its joss-house and priests”. 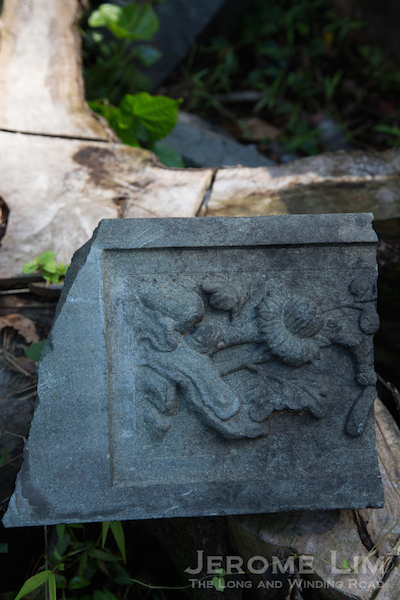 Another fragment of the past found on the hills of Tiong Lama. 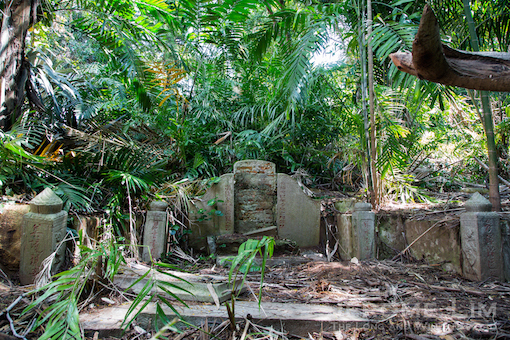 The “old cemetery”, as tiong lama, a combination of Hokkien in the “tiong” (cemetery) and Malay in the “lama” (old), translates into; had by the time of the report been supplemented by a new cemetery to its east, referred to as “Tiong Bahru”, a name that now brings to mind its offerings for the living rather than ones intended for its early occupants. 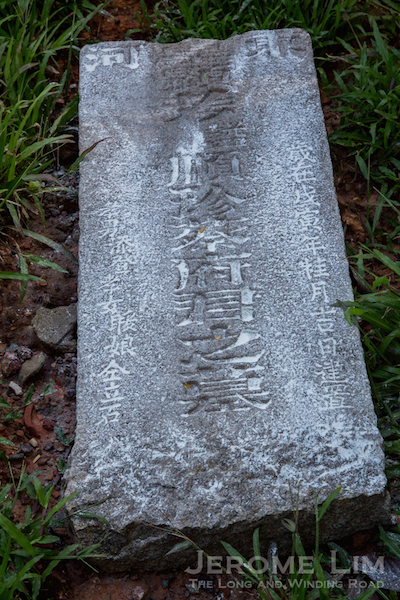 A head stone of the grave of a member of the Khoo clan from 1842. I was to find out more of the Gohs’ discoveries during a walk organised by the Tiong Bahru Heritage volunteers that the brothers led over the weekend; discoveries that might perhaps have made the visits to hospital grounds, of which I made many as a child to see a relation in the nursing profession living in the nurses’ quarters, a little spicier. 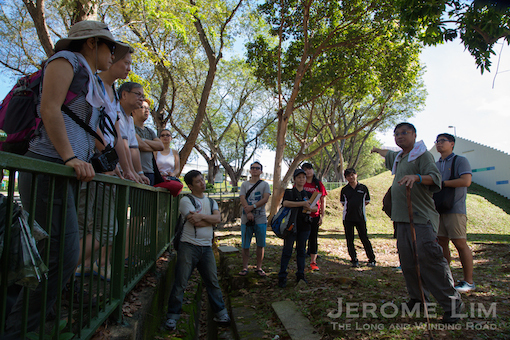 On the eternal slope: Raymond speaking to the participants of the walk, with Charles looking on in the background. Just a stone’s throw from one of the quarters, which I realise was very recently pulled down, is the area once referred to as Eternal Hill, Heng San (恆山). At the foot of its slope, which a stretch of Hospital Drive (previously a section of Silat Avenue) runs through down to Jalan Bukit Merah, stood the Heng San Teng (恆山亭). 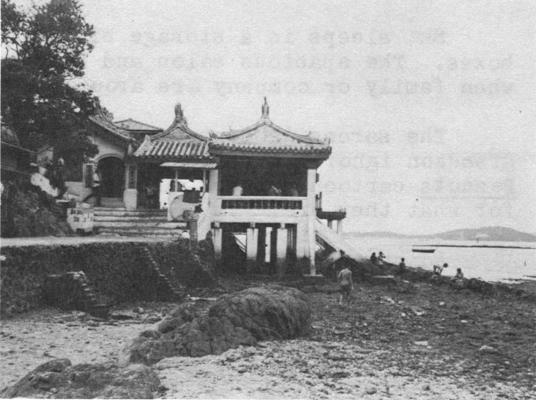 Heng San Teng before its destruction (National Archives of Singapore). 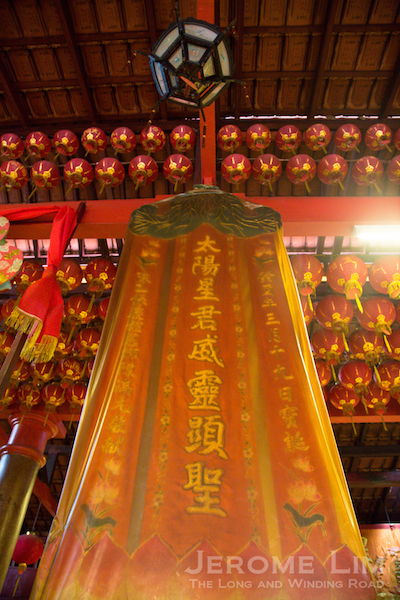 The temple, founded in 1828, was the focal point for the Hokkien immigrant community in Singapore prior to the Thian Hock Keng assuming the role, and stood watch over the cemetery. The historic temple was destroyed by a 1992 fire, well after the cemetery was exhumed in the early 1900s. All that has survived, are a few pieces of the cemetery, discovered by the brothers, that have somehow been left behind. Eternal Hill today, eternising life. 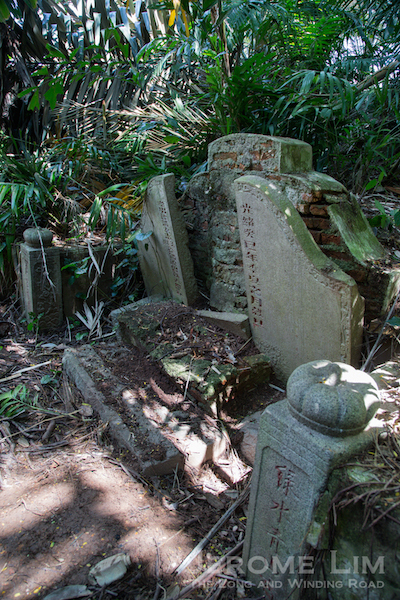 Of the remnants of Tiong Lama, one is a head stone belonging to the grave of a lady from the Khoo clan that dates back to 1842. It now lies on a part of the slope, close to evidence of a more recent activity that took place on the slope: rectangular troughs of brick and cement. These, as confirmed by an ex-resident of the area, were water troughs used by an Indian dhobi, who took on laundry work provided by the hospital. A few blocks of concrete can also be found on a terrace just above the troughs which the ex-resident said were used to support laundry drying poles. The troughs used by dhobi, with a broken piece of relief that would have been from a former grave. The loose headstone on the slope. 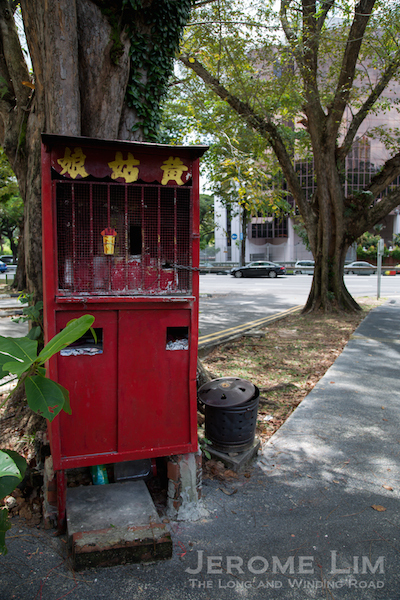 What is perhaps also interesting, is a curious little shrine against one of the trees lining the road. Painted in red, it bears the Chinese characters 黃姑娘 in gold, which Mandarin-ised, reads as Huang Ku Niang, reputedly a resident of a nearby village who had lived around the turn of the last century. 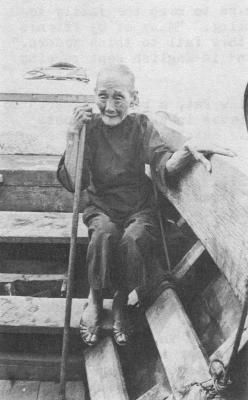 Miss Huang or Ng, as she would have been known in Hokkien, had been a cleaner turned nurse, who had received her training from a doctor at the General Hospital. Her dedication to saving lives had apparently extended beyond her hospital duties and whilst attempting to rescue a fellow villager from a fire, the house she was in collapsed on her, ending her life prematurely. 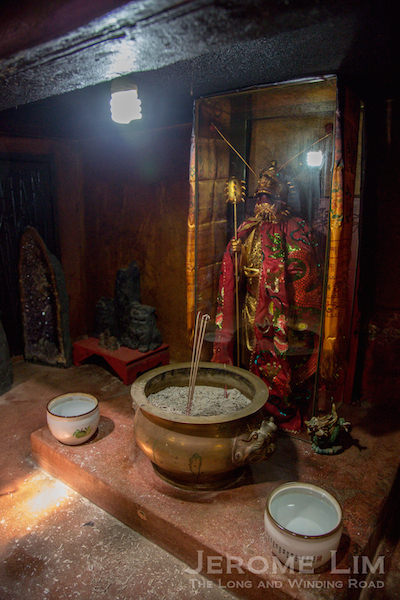 The shrine to Huang Ku Niang. Huang Ku Niang’s dedication seems to have also extended into the afterlife. Her spirit has often been sighted roaming the area of the slope, seeking to further her cruelly interrupted mission. Many afflicted with illnesses, offer a prayer at her shrine. The deitised Huang Ku Niang is reputed to have the ability to deliver her devotees, from their ailments. The slope where the dhobi operated. Concrete blocks used to support laundry drying poles can be seen on the upper terrace. From Hospital Drive, the walk continued east down Jalan Bukit Merah, to the slope where the old tiong met the new tiong. 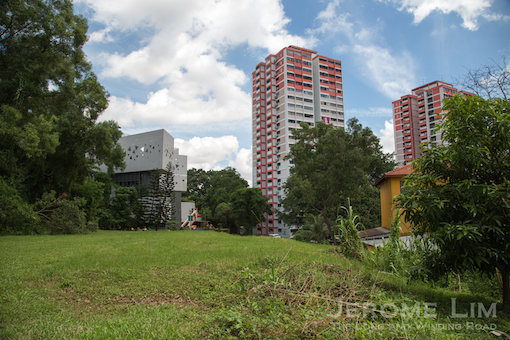 The area is close to where towering blocks of the newest additions an urbanised Tiong Bahru are now coming up, in stark contrast to an area of seemingly dense vegetation separating it from the hospital. In part of the green area, recently cleared of its trees, is the area where a cluster of uncleared graves from the second half of the 1800s, were also recently discovered by the Gohs. An area of dense vegetation at the edge of the hospital’s grounds. The graves, four of which are marked by simple single head stones (two of which has fallen) placed from the 1860s to 1878 (more information can be found in this link), also includes one that still lies hidden in the trees. The latter has a more elaborate structure bearing a closer resemblance to the Chinese graves we see today, and dates back to the 1890s. 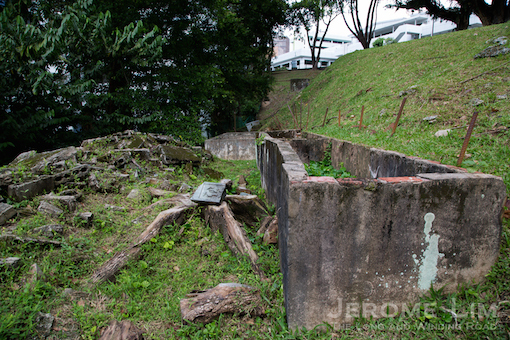 The graves are the remnants of a burial site belonging to the Chua clan, occupying a private strip of land sandwiched between Tiong Bahru and Tiong Lama that would have been referred to as Seh Chua Sua. The first of the Chua graves from the 1860s. 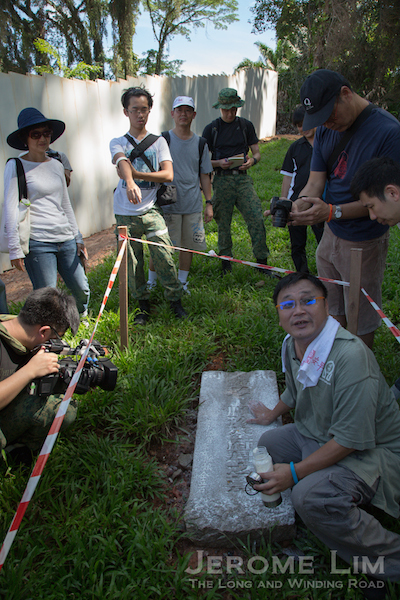 Raymond Goh showing how he uses flour to bring out the faint inscriptions on the third headstone. 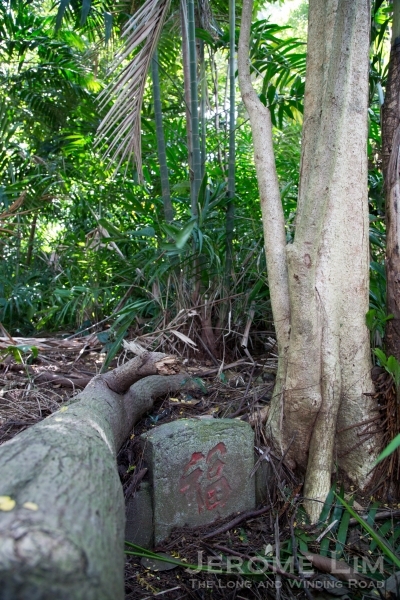 The Chua grave hidden in the trees. A tablet marking the altar to the earth deity placed next to the last grave. One half of a pair of lion guards that has somehow merged into root of a tree. Close by is one further discovery unrelated to the burial site made by the Gohs – a wall that is thought to have been the perimeter wall of the Lunatic Asylum that would have been built in 1887, part of which has recently been removed. What would have once been a wall that towered three metres high, it is only a section of the top of it that can now be seen. What’s left of the wall of the Lunatic Asylum. 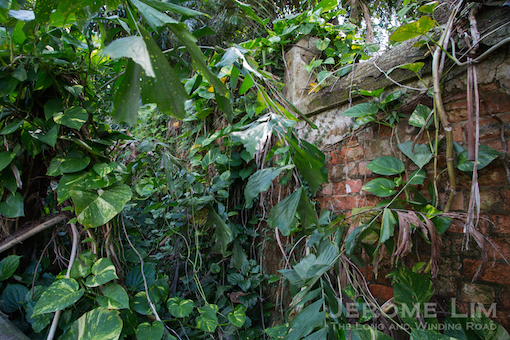 Part of the wall lies partially hidden by the dense vegetation. Across Jalan Bukit Merah from the site of the Lunatic Asylum is Silat Estate, where Kampong Silat also known as Ku Ah Sua (龟仔山) – the village that Huang Ku Niang had apparently hailed from, was sited. A hillock, which gave the village its Hokkien name, which translates into Little Tortise Hill, was where the walk was to end. Tai Yeong Kong on Ku Ah Sua. Inside the Tai Yeong Kong. Nestled on the hillock are two temples that connect the hill to the now missing village. Lying now in the shadow of a block of HDB flats, the hill is dominated by the yellow structure of the Tai Yeong Kong (太阳宫). Dedicated to the sun god, the syncretic temple is housed in part in a structure that resembles a beach side villa from the early 20th century. 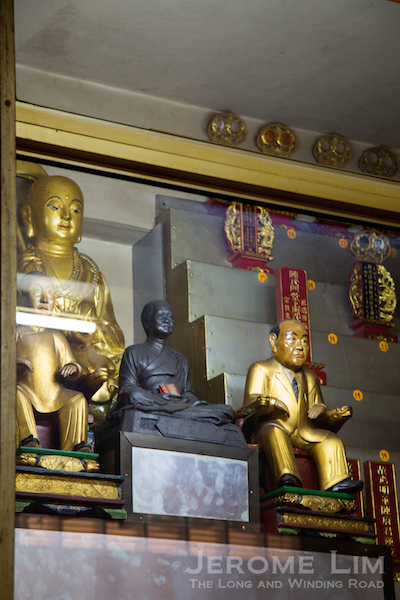 Within the temple, devotion extends beyond the Taoist deities, to a Hindu god along with ancestral deities and several images of bodhisattvas. 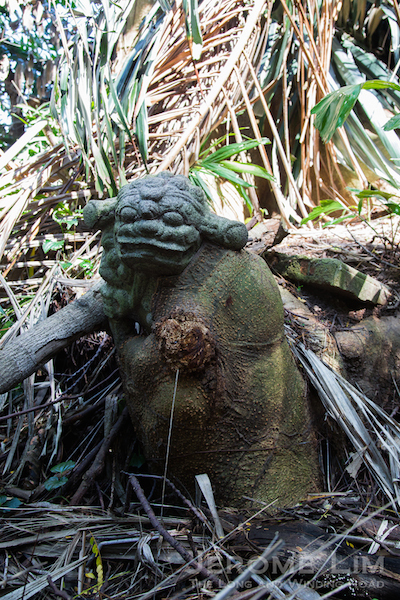 Inside the Tai Yeong Kong – a reminder of an old world. 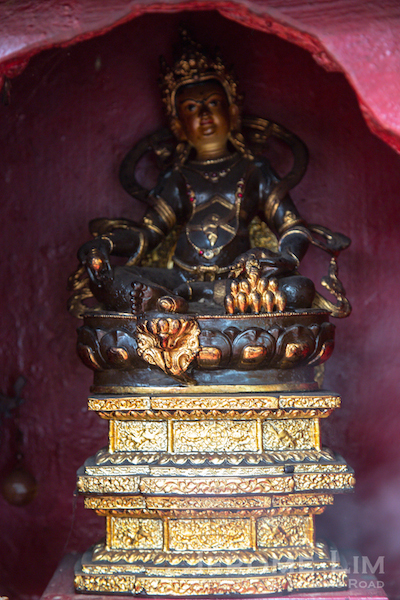 The dragon deity under the main altar. Ancestral tablets and deities, including one with a neck tie. A tantric deity outside the temple. 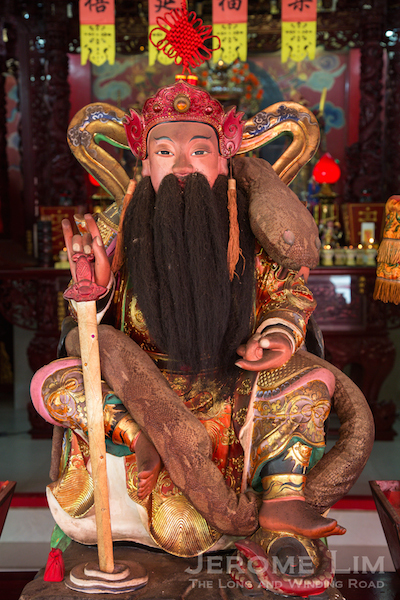 The other temple on the hill, Chia Leng Kong (正龙宫), the main deity of which is the god of the North Star, Xuan Tian Shang Di (玄天上帝), actually sees several Taoist temples associated with Ku Ah Sua merged into one. The temples operate on Temporary Occupation Licenses on land that belongs to the Housing and Development Board and it may be possible that the links they have long provided to the area’s past, may in the future, be broken. The crest of the little tortoise hill where a cemetery once existed. 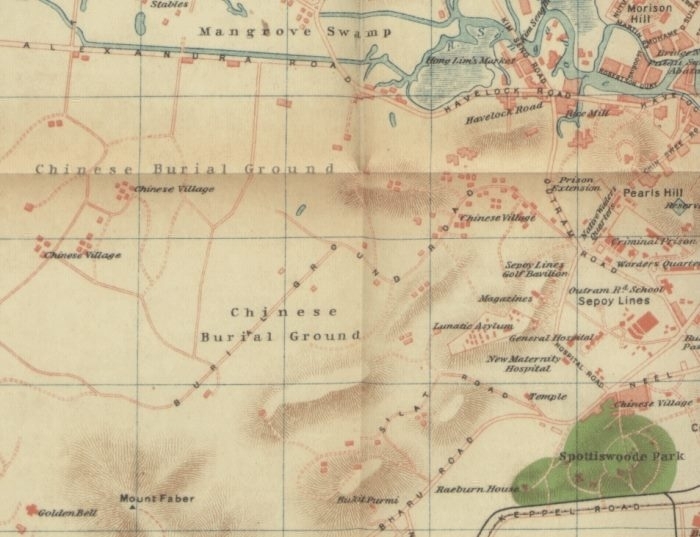 Extract of a 1920 map. The extent of the burial grounds at Tiong Bahru and Tiong Lama can be seen. On the map is the Heng San Teng location, marked as “Temple” on the lower right. The Lunatic Asylum can also be seen in its vicinity.